Woodturner's Resource - woodturning message boards, art galleries and more! Since his early years, Bill has had a keen interest in creative expression. He has pursued that interest in many mediums, including silver jewelry and metal sculpture, but mainly in wood. His first encounter with woodturning was in Junior High wood shop, where a few bowls were turned using terrible tools with no instruction. However, this woodturning experience intrigued him and in 1989, a latent interest in woodturning was rekindled after he bought an old secondhand Dunlap lathe from a friend. Since that time, Bill has become an avid and active woodturner. He feels challenged in a new and exciting way by the artistic and technical avenues into which this medium has expanded. Artistic expression in turned wood has exploded in the last 25 years, and Bill is enthusiastically a part of this creative direction. Living in the greater Los Angeles metropolitan area, Bill has the opportunity to belong to and attend several woodturning organizations. He was the newsletter editor for two of those organizations for 6 years, and subsequently he became the president of the very active and sizeable Glendale Woodturners Guild. 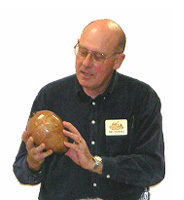 In the summer of 2003, Bill was largely responsible for installing the AAW "Put A Lid On It" exhibition at the Brand Gallery, along with the Glendale Woodturners "Trees To Treasures" show. Mentoring numerous turners in his workshop, demonstrating woodturning techniques to various chapters and other venues, and exhibiting at local art shows and in several galleries are some of the woodturning activities in which Bill has been involved. Recently, the Home & Garden Channel (HGTV) filmed him on the lathe and also performing the biomorphic piercing work he incorporates into some of his pieces. Natural elements found in timber (some might say imperfections) are often used to advantage by Bill in his work. Such features as bark inclusions, unusual figure, distressed areas, spalting (which is the initial stage of decomposition), natural edges, and sapwood/heartwood color contrast are often employed to achieve striking and unusual character in a way that works with the form. 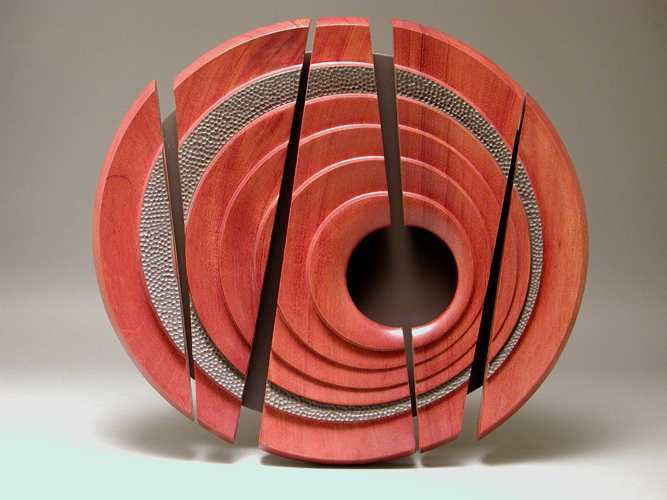 In his turning, Bill seeks to explore form composition in turned objects, often with woods that offer rich figure, color, and unusual character. While finished wood is a warm, sensuous, inviting, and tactile material, creating a beautiful form in each piece is primary. His ultimate goal is to create an appealing shape that is complementary with the distinctive quality of the wood used in each one-of-a-kind piece. 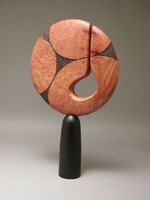 More recently, Bill has used carved and/or pierced designs to enhance his pieces after the lathe work is done. In most of these cases, a less dramatic wood is used to minimize competition between the natural character of the wood and the carved/pierced design. Examples of his carved and pierced work can be found in his vessels with tuxedo and seed pod openings, as well as in his coral series and flame tongue carved vessels. Each log or block of wood that is put on the lathe becomes an adventure in discovering the inherent nature, characteristics, and beauty of the wood, but an even greater adventure for Bill is the process of creating an appealing and unique form. He hopes and strives for continued growth in that discovery process and the creation of distinctively attractive pieces. 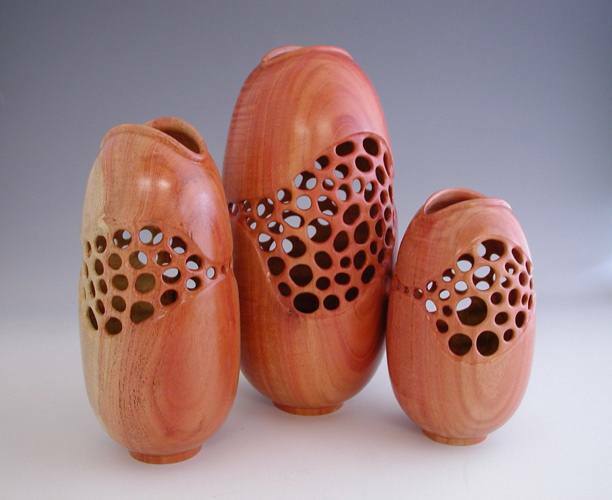 8" with carved undulating vertical sections Carob hollow vessel trio "Coral Impressions"
14", PSL is Parallel Stranded Lumber, made up from pine strips formed into construction beams. This started out as a cutoff from a 6'X12" beam. Mahogany wall sculpture "Mahogany Ripples"